So you think your wedding guest list is long? Imagine planning a wedding with over 200 bridesmaids. Texas couple Tina Ackles and Thomas Rodgers will attempt to break the world record for most bridesmaids with 220 chosen ladies, Saturday, April 18, 2015 at the Saftey Harbor Resort and Spa. 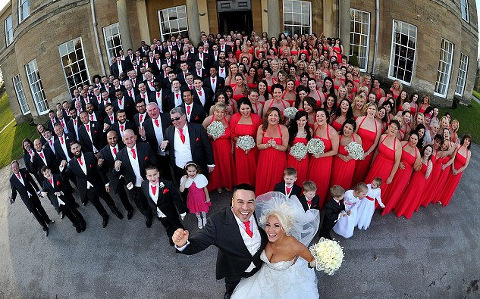 The record was previously held by a U.K. couple with 130 bridesmaids. U.K. couple and current world record holder. As reported by ABC Action News, Ackles will include over 200 members from The American Business Women’s Association in her wedding party. The leadership group is holding its annual conference at the resort this weekend, where the bride strategically planned to hold her destination wedding. “I decided when you are having a wedding, you can’t cut out any of your sisters,” Ackles explained. “And like any ole Texan would say “Go big or go home. So here we are. We’re going big,” the couple added. The bridesmaids, who range in age fro 18-80, will wear black dresses of their choosing with red shoes.